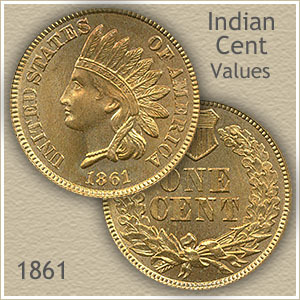 Your 1861 Indian head penny value is driven higher than average for many reasons. Very popular as a series. 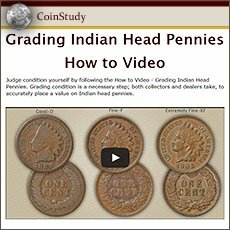 Indian pennies are avidly studied and collected by many. Historically important, an 1861 penny marks the first year of the US Civil War. Also setting the early years apart, the metal alloy used is copper-nickel giving the coins a distinctive yellow color. Your old penny is a sub collection within the Indian penny series, an important Civil War year and a temporary different alloy. Many assemble specialized collections of these years alone. Your 1861 penny is part of an important sub set of the series. Made of copper-nickel not the 90% copper alloy use for the rest of Indian head pennies. These coins minted from 1859 through part of 1864 form an interesting collection. They represent a design change on the reverse, are actually thicker and heaver than later pennies and were minted during the US Civil War. Popular and with a "story" auction results are strong when an exceptionally nice one is offered attracting many bidders. 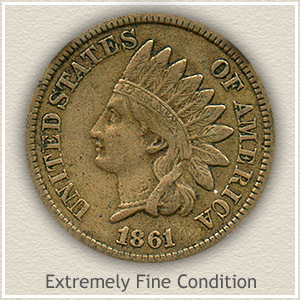 With competition from collectors and dealers this rare condition 1861 Indian head penny value settled at $690. Important to your coin's value is condition. Coins are "graded" by the amount of wear they have endured. 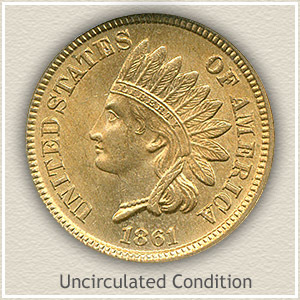 You can get an idea of your coin's condition and grade by comparing to the images and descriptions. The value chart lists separate values for each. Extremely Fine: Although a small amount of metal has worn from this 1861 penny it is still very sharp and crisp in appearance. Important is a readable "Liberty" within the headband. Her cheek remains well rounded as does the hair detail on the neck and near the eye. Clear separation of all design elements is necessary to reach the extremely fine grade. 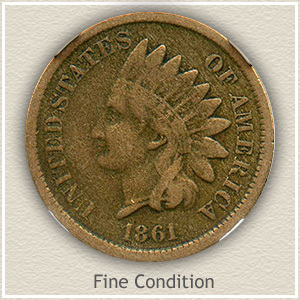 Fine: Worn somewhat flat but all major details clear describes an 1861 Indian penny in fine condition. Her chin and cheek has worn flat, much of the finer detail separating the curls of hair are smoothed into one. The headdress is recognizable with the headband and feathers separated. Overall a bold image remains. $1 to 2 dollars for common dates. 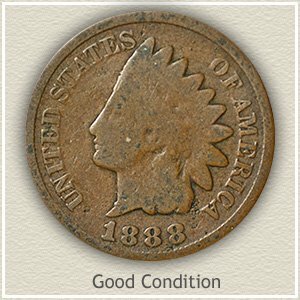 With many advanced collectors pursuing Indian pennies and forming great collections the rare dates are rapidly moving higher including your 1861 Indian head penny value. Better condition coins are especially sought. Your box of old coins has never been more valuable. All old US coin values. The home page is an excellent index, quickly leading to the major coin series. From Cents to Gold. Each with grading images and value charts. An important step in preparing for selling and finding coin buyers.